NEW YORK (CNNMoney.com) -- This week, the Obama administration began outlining additional measures to jumpstart the economy and create jobs. But even if passed, Obama's proposals are too little and too late to reverse the downward trend of economic activity, according to some economists. How secure is your job over the next year? Rock solid. I may even be promoted. My job is safe, but I don�t expect a big raise. I�m worried; my company is still cutting jobs. I�m out of work now. "We already are in a slowdown, so no matter what they do, there is a risk of another recession," said Lakshman Achuthan, managing director of Economic Cycle Research Institute. 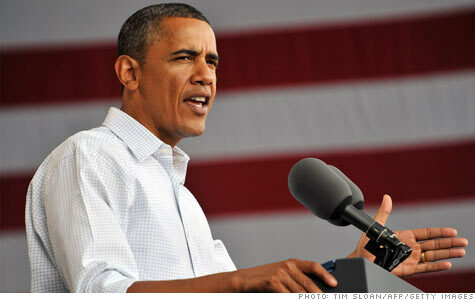 He said any action to spur the economy was needed near the beginning of this year when the economy still had momentum. The proposals, which are not expected to pass through Congress quickly, include an estimated $200 billion in tax breaks for businesses that invest in new plants and equipment, a $100 billion extension of the business tax credit for research and development and $50 billion over the next decade to improve roads, rails and other infrastructure. These plans come on top of existing administration proposals to extend tax cuts to households earning less than $250,000 a year, and provide $30 billion to spark an increase in lending to small businesses. "I don't think the [new] proposals taken together are a game changer," said Mark Zandi, chief economist of Moody's Analytics and a strong advocate of further government action. "They're helpful but they're not going to jump start the economy, at least not in the next 6 to 12 months." Allowing businesses that make equipment purchases to write off the cost of the investment right away, rather than over a period of years, might spark some capital spending, but will have limited impact on employment, according to Zandi. It could even cost some jobs if a business buys technology from overseas that improves productivity rather than hiring more U.S. workers. "Investment spending has picked up very nicely, that's not the problem," he said. "The problem is a lack of hiring. This is driven more by what [Obama] can get through Congress than by what will create jobs." With record cash on corporate balance sheets, the tax credit will do little to spur additional short-term spending, echoed David Rosenberg, chief economist and strategist for investment bank Gluskin Sheff. "We already have business spending running at its fastest rate in three decades without the need for more deficit-financed tax incentives," he said. "In other words, how ridiculous is it for the government to be targeting tax relief to the one part of the economy that needs it the least?" Allen Sinai of Decision Economics also sees limited impact from any of the proposals. He said the infrastructure spending is only going to add to government debt without providing long-term help for the economy, and that similar spending in Japan did little to prevent a so-called "Lost Decade" there in the 1990's. "We need outside-the-box, big picture thinking to have a big effect on the muddle-through economy we're facing," he said. David Wyss, chief economist with Standard & Poor's, said he believes increased spending on infrastructure is necessary to help the economy long term. And allowing the spending from the 2009 round of stimulus to end later this year without being replaced by new government spending would be a mistake given how weak growth has become. "I think going cold turkey would be dangerous," he said. Zandi and other economists say the best thing Congress can do to ward off a double-dip recession is to extend tax cuts passed during the Bush administration for families making less than $250,000, something already proposed by the administration. If that happens, "I think we make our way through without recession," Zandi said. "If everyone's taxes go up, we'll have a double-dip. But I don't see that happening."